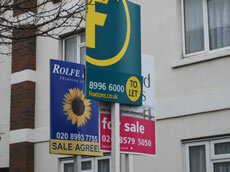 The average price of a property in the W3 area sold during February was £357,500. This compares to an average price in the fourth quarter of 2009 of £296,365. 38 properties were sold during the month. In February, London's annual house price change according to the Land Registry index was a positive 11.9 per cent, which is an increase from last month's figure, and the fifth month in a row in which the movement has been positive. It was also the strongest growth of any region. The average value of a property in London is now £333,394, which is a decrease from last month. For the country as a whole there was an annual increase of 7 per cent. This is the fourth month in a row in which the annual movement has been positive. The monthly house price change is negative this month, at -0.3 per cent. This brings the average house price in England and Wales to £164,455. The Rightmove House Price Index for February 2010 reveals that average asking prices increased by over £7,000 in the past month. This is the largest monthly increase since April 2007 and represents a year-on-year increase of 6.1%. In London they are showing the highest ever level of asking prices. Miles Shipside, commercial director of Rightmove comments: "A price jump of over 3% is more comparable to the pre-credit-crunch boom-times. Sellers are setting their sights higher, and some agents are going along with them in order to win scarce instructions. Property for sale remains scarce in popular areas, but new supply to the market has to be priced at what buyers are willing and able to pay. An average increase of over £7,000 may prove to be a bit too spicy for some buyers' tastes, now that economic constraints have forced them to develop a simpler palate."